When I was in fifth grade, reading everything I could get my hands on, I managed to get my hands on a new book called Harry Potter and the Sorcerer’s Stone. Not much for mindless rules and prohibitions, my parents did not give in to the clamor of Christians ’round, who said that if they let me read this book of sorcery I would surely turn away from the Truth of the Gospel to the dangers of modern day witchcraft. Instead my mom asked me, “Do you know that magic isn’t real?” I nodded my fifth grade head, anxious to start the magical journey. “Well, alright then,” she had declared. And that was that. Alllright. You’re not buying it? Yeah, it’s probably not true that a conservative housewife rewrote the entire Harry Potter series into a series of Christian platitudes and “holy energy.” But it definitely is true that thousands of well-meaning parents have banned their children from ever enjoying anything remotely Harry Potter-esque for fear of its powers of evil. Some time ago I got tired of a certain prayer. I got tired (and bored) of praying for people to become Christians. It just felt repetitive and ineffectual and lacking any real emotion. “I pray that this person will become a Christian.” Blah. Even, “I pray that this person will come to know You as Lord and Savior.” You can only say something so many times before it completely loses all meaning. Try it. Say “clipboard” like seventy times in a row. Now say it again. Doesn’t hold much meaning does it? It’s just noise, meaningless language sounds. Now pray, “Help him become a Christian,” for about ten years. Same effect. Meaningless language sounds. So I decided to mix it up. Put some soul into it. You know, actually mean what I say and all that. Now I say, “Today I pray that this person would see You more, would see more of Who You Are.” Now my desire is that as we go about our day, that we would see more of Who God is. Because we could all do with a little more of Who God is, am I right? This summer – or what is over Christmas break? Well, one time in the United States I was talking to a friend about her church commitments. She was feeling a little overwhelmed. Each week she was supposed to bring a name to her small group, the name of someone with whom she had shared the gospel. She mentioned how misguided this felt as she and her husband live in a neighborhood and attend a church with the main goal of building relationships with people in order to show them Jesus (to show them more of Who God is, if you will). Theirs is a relational ministry. And relationships are delicate. And individual. And take time. This friend of mine realized that sometimes sharing the gospel isn’t the right thing to do. Which sounds sacrilegious and anti-bible and scary. But what she was saying is that sometimes the next right thing to do is invite someone into your home and make them something good to eat. Sometimes the next right thing to do is to see someone as a person and not as a statistic. Sometimes the next right thing to do is to pray for someone, to lay a hand on their shoulder and love them right out loud in front of everyone. Sometimes the next right thing to do is to make eye contact and smile. Sometimes, yes, the next right thing to do is to get out your Bible and read straight from it the beautiful, powerful words of Truth. All the time, at the heart of all of the steps, is God – showing ourselves and those around us more of Who God is. And wouldn’t you know it? One of the things that helps me know Who God is more is Harry Potter. Just the other day I witnessed the death of Sirius Black for probably the thirtieth time. I was listening to the Order of the Phoenix audio book and that awful time came. Siruis fell through the veil and never came back. And don’t we all just hate Bellatrix? Sirius has never been one of my favorite characters. I don’t have any beef with the guy or anything, he’s cool, but we just don’t click. He is, however, the character from whom I’ve learned the most. Something Sirius Black once said literally changed my life. Changed the way I see people, changed the way I see myself and showed me more of Who God is. Did you know that words don’t have to be straight out of the Bible to be Truth? Did you know that you can learn from people without agreeing with them completely on every point they’ve ever made? I didn’t always know that! But guess what- The world isn’t split into good people and Death Eaters. The world isn’t split into good people you should always listen to and bad people who are always wrong. The world isn’t split into righteous people who God loves and messed up people who don’t have a chance. We are all Loved and we are all Messed Up. We all have dark and light inside of us. Dark being our selfish, misguided mistakes and Light being mercy and forgiveness and more chances. Dark being every time we choose our own way over God’s and Light being every time Love Wins. Dark being pride and arrogance and lies and Light being grace and others-first and Truth. Dark being anything that leads us away from the God of Life and Light being anything that pulls us forward. No, we are not all good or all bad. We are all created for good, intended for good, but have been perverted into something wrong and dark. We all have Light inside of us. We all bear the image of a good God. And yet from time to time we all find ourselves sitting in the dark, in the company of Death Eaters, wondering if we’ll ever be able to find our way back to the Light again. What matters is the part we choose to act on. Until we get to heaven we will never be without our Dark, our sin nature, the parts of us that remember only our failures. But we can choose to act on the Light inside us too. Choose to act on that Light so much that it starts to overpower the Dark, chasing it away, illuminating who we really are. A wonderful and thought-provoking post, as always. 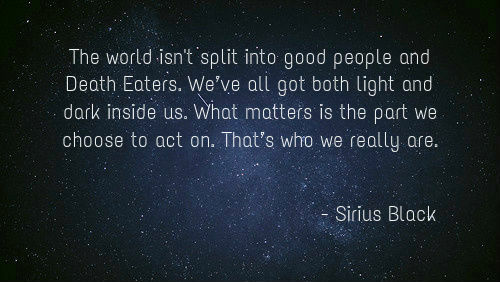 I love that quote from Sirius. Lessons that coincide with Biblical truth in the Harry Potter Series. A great read! I really enjoyed reading this. It is an enlightened point of view. You have a great deal in common with the few Christians I call friend in your open-mindedness and thoughtfullness. I am an atheist myself. I am not here to troll or disagree with your beliefs. Morally speaking there are truths that transcend a persons core beliefs, and you hit that quite well. When I used to be a Nicherin Shoshu Buddhist (I practiced that religion for 21 years) we would chant (pray in essence) for a persons happiness with the idea that if they were happier, or more enlightened, they would stop being an unpleasant person. I would recommend that for a possible prayer to replace the one that has become old for you. Excellent read, thank you again. Welcome, I am glad you are here no matter what your religious beliefs or background! That prayer reminds me of a Roald Dahl quote. It’s something like, “if you have pleasant thoughts they will shine out of your face like sunbeams and you will be beautiful.” It all starts on the inside. If you want your outside to change, you have to change the inside. I believe that the best way to change your inside, is to get with Jesus! Thank you, so much, for your comment!! You write beautifully. Just saying. 🙂 It’s been great discovering your blog and scrolling through it.